Since most millennials are more likely to have no clue about this structure, here’s a little something to keep its history alive. As most folks know a large portion of Flushing Meadow Lakes was the prime location for the two New York World’s Fairs. The first one took place in 1939 and 1940. This event was a godsend. Finally, after years of Queens Neighborhoods suffering from filth and mosquito infestation of Flushing Lake, 1,200 acres of ash dumps were replaced with a plethora of architectural beauty. 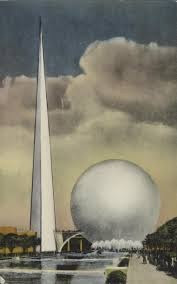 The iconic symbols of this event were the Trylon and Perisphere. Some readers may be familiar with the word ‘Trylon’. After all there was the infamous Trylon Movie Theater. 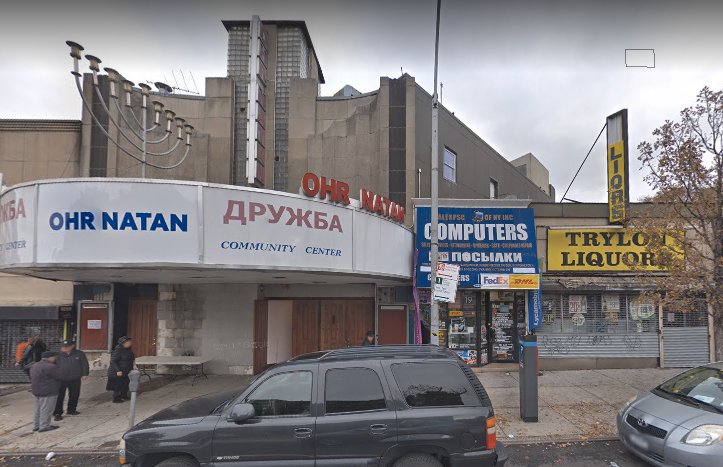 Remnants of it can be seen at its original location on 98-81 Queens Blvd. It became a Bukharan Center. There’s also the Trylon Liquor Store only several storefronts away as well as the Trylon Vet Care. But after a horrific fire in 2010 the Vet Care moved over to Austin St. Forest Hills. But enough of the 1939/40 symbols. 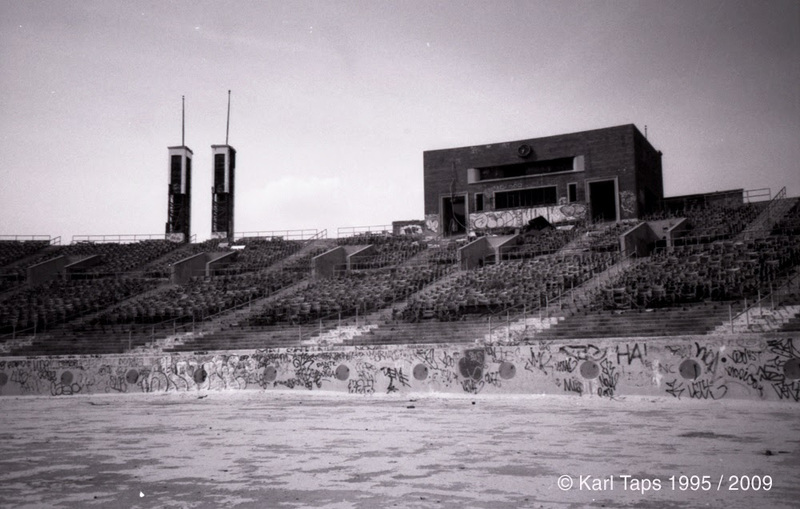 What really is the main focus of this article is to tell of the infamous amphitheater in Flushing Meadows-Corona Park. 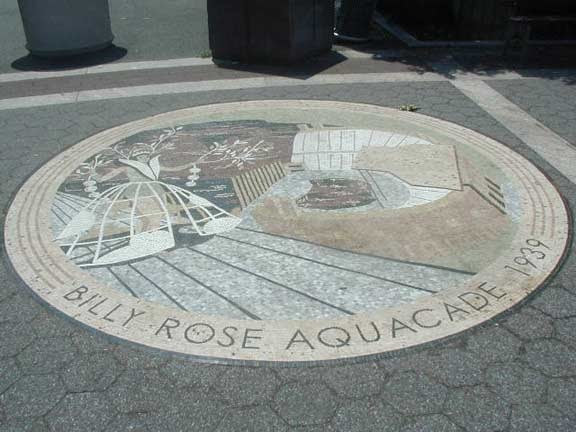 Back in the day it was known as Billy Rose’s Aquacade. Rose had a major presence in the field of entertainment during the 30’s and 40’s. He was married to Fanny Brice of Ziegfield Follies Fame and even wrote the lyrics for hits like, “It’s Only a Paper Moon”, and “Me and My Shadow”. The Aquacade was to provide entertainment for crowds of people. This structure not only included a humongous size pool for choreographed swim shows but also revolving stages, a 75 foot diving tower and 40 foot water fall. Entertainers included Olympic Swimming champion and first movie actor to portray Tarzan, Johnny Weissmuller, competitive swimmer and actress Esther Williams, Olympic Swimmer and actor Buster Crabbe. 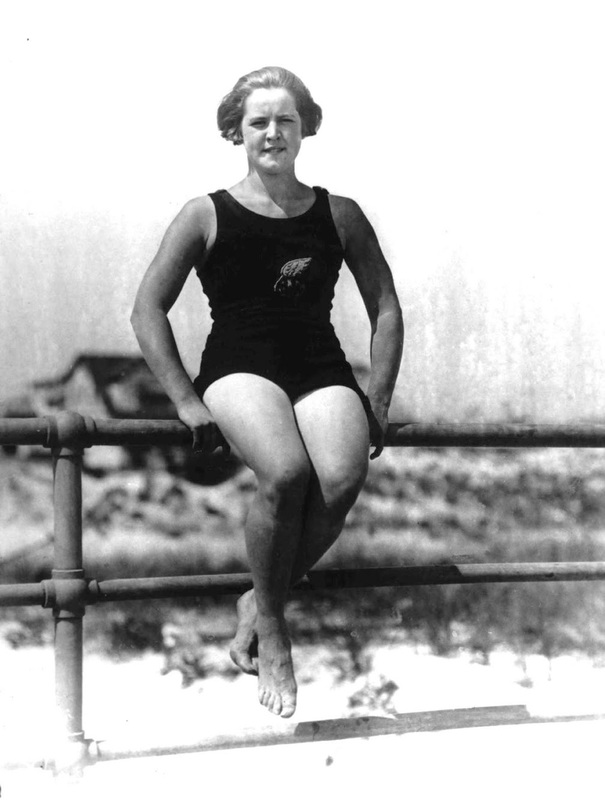 In addition another star attraction was Gertrude Ederle, a Gold Medal swimmer who was also the first woman to swim across the English Channel and who was also a Flushing resident. 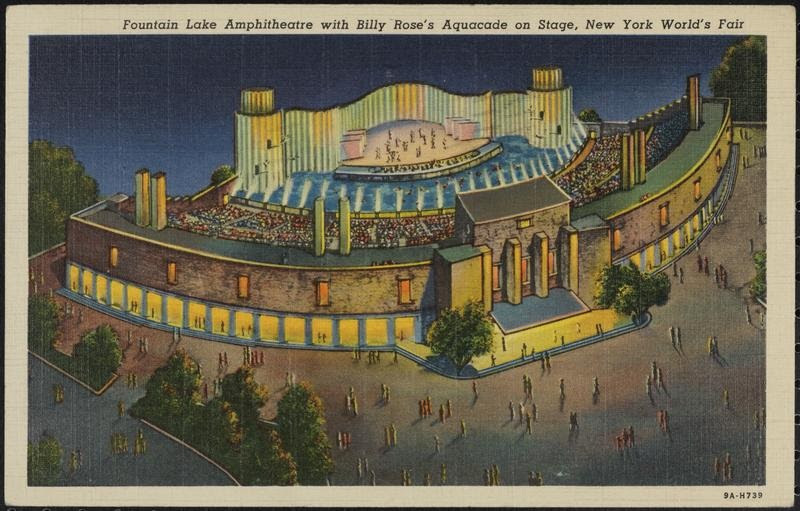 When the Fair closed in 1940, the Aquacade was one of the few structures that remained. It continued to host aqua shows yet in the 1950’s it ended up becoming the perfect venue for a necessary outdoor swimming pool. When the World’s Fair came around again in 1964 the Aquacade was once again renovated for water shows. And naturally when the World’s Fair ended this site was once again re-opened as a public pool and renamed The Gertrude Ederle Pool. But sadly the pool fell into disorder and became a haven for vagrants. While driving on the Grand Central or Van Wyck, it looked like a backdrop for a war zone. Despite the numerous efforts of Queens preservationists the water front structure was demolished in 1996. 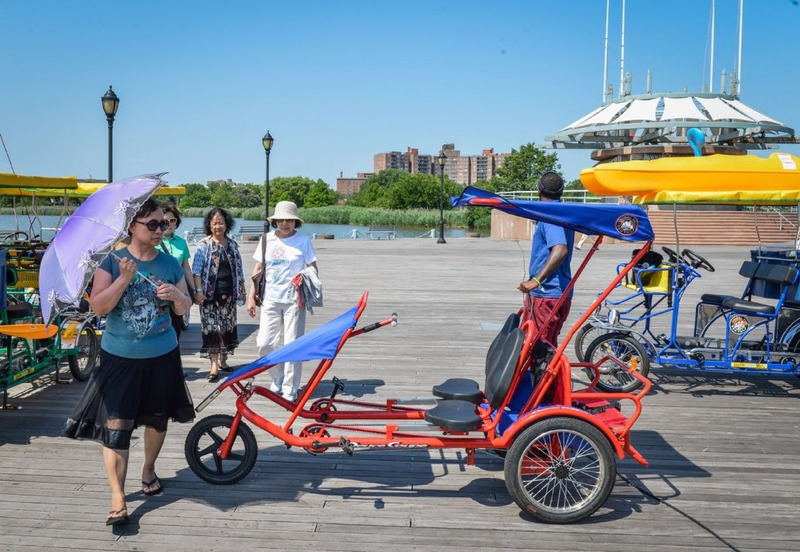 Over time the Aquacade was converted into an area that today includes a wooden deck, restrooms, grassy knolls and plenty of green space for bicyclists and pedestrians. This was a long and arduous project due to the removal of large concrete slabs. However, there are still some that remain that even offer clues of the Aquacade’s past grandeur. Today this area is now known as Ederle Terrace. To learn more about this inviting area, click here. 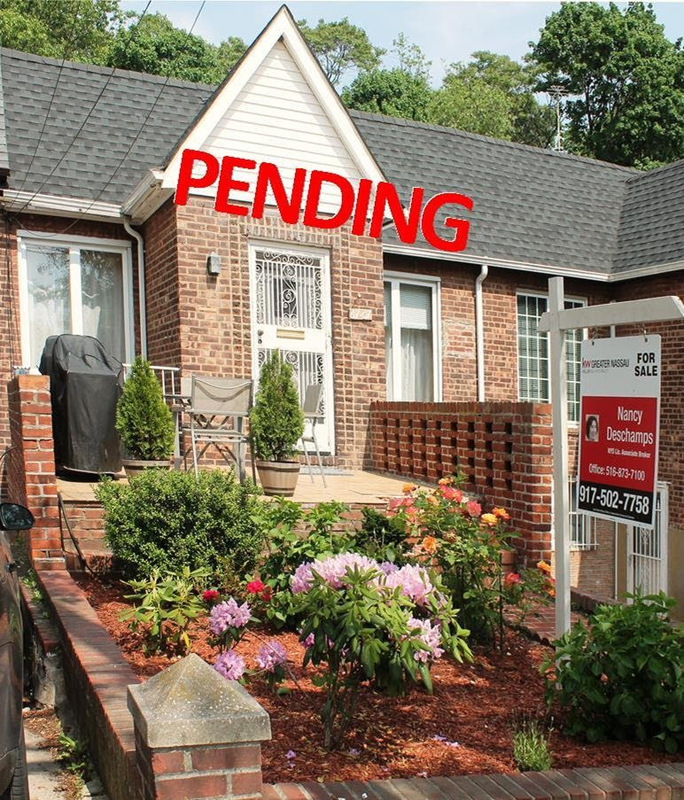 Next: Time to Check out Living in Long Island?